รับประกันศูนย์ 1 ปี : ฟรี !! กระเป๋าใส่ขาตั้ง Manfrotto 70 Cm. 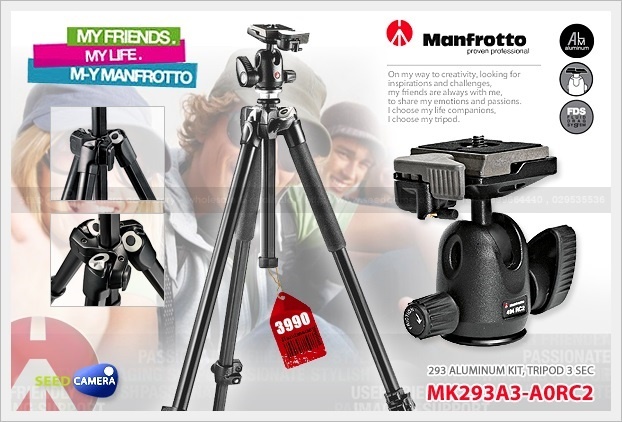 The MK293A3-A0RC2 is the intermediate 3 section kit combined with the detachable aluminium ball head. It is the best solution for lightweight and rapid movements. The anti-shock collar protects your camera from accidental impact, whilst the 3 faced design column prevents rotation to allow for increased accuracy and steadfastness. The leg locks provide a rock-solid support and with their innovative adjustability they provide a consistent and excellent performance.